Goals from Bastian Schweinsteiger and Shkodran Mustafi sent Germany to the top of Group C with a narrow win over Ukraine, but more defensive vulnerabilities were exploited and Joachim Low's men were lucky not to concede two or more goals. Toni Kroos' smooth, sublime play in the midfield helped Germany create chances and kill opposition moves; his crisp passing, versatility and awareness played key factors in Joachim Low's team salvaging victory. Yevhen Konoplyanka and Andriy Yarmolenko were the bright sparks in Ukraine's attacking play; creating an array of chances in the first half. A disallowed goal and Jerome Boateng's goal-line clearance emphasised the Germany will face to win the tournament. As an array of illustrious starlets entered the field, they were greeted by a spine-tingling atmosphere stemming from two devoted nations consuming what was a very special occasion at the Stade Pierre Mauroy in Lille. While confronting a fierce attacking force, renowned for its brutality in the air and precision on the ground, Ukraine's slim hopes of victory had perhaps been mildy boosted given a natural midfielder, Mario Gotze, was leading the world champion's forward. Joachim Low's side opened proceedings strongly; bristling with crispness, hunger and intent. A meaningful run culminated in Julian Draxler letting fly from the edge of the area, before Yevhen Konoplyanka provoked an athletic save from Manuel Neuer following a stabbing strike heading towards the top right corner. More chance of English and Russian fans making up than beating Neuer from that range, you'd feel. But Konoplyanka refused to back down on the big stage. A brief patch of success drove the Germans even further up the field, however. Savvy movement from the promising Draxler on the left led him to finding Muller at the back post, who cushioned a header down to Hector on the volley but his effort frustratingly blootered over the crossbar. With such high stakes at a prestigious tournament, Kroos' rare indiscipline got the better of him. A dangerous elbow caused the referee to hand him a stern warning. As the world champions continuously probed but to no avail, the most unlikely source of Mustafi found the key to unlock the door. A fantastically measured free-kick from Kroos on the right swayed past every defender and found the towering full-back who planted a superb, precise header past Pyatov. 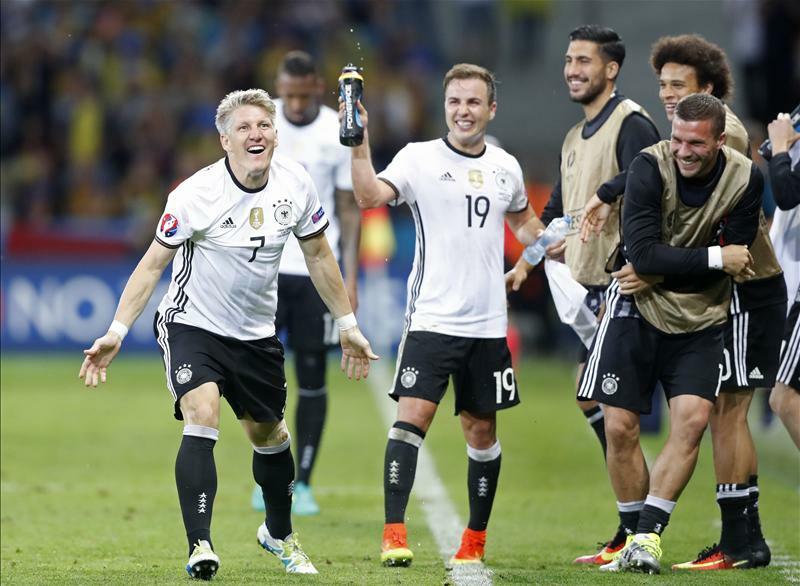 Usually it's Bastian Schweinsteiger's job to run proceedings in the middle, but Kroos had taken over to full effect. Pulling the strings, killing moves and creating his own, he had been at the heart of every Germany attack. He then audaciously advanced up the field himself, but his left-footed grass cutter deflected wide of goal. Despite Low's men controlling large portions of the game, Ukraine occasionally reminded them of their ambition and intent. Neuer reacted well to Khacheridi's bullet header, subsequent to Jerome Boateng clearing further danger following a low corner. Germany's midfield machine Kroos continued his sublime play. Lobbing over Khedira, who while isn't renowned for speed, instantly pounced and found himself through on goal. However a poor touch prevented full connection and Pyatov clubbed the stabbing shot away from close range. As the action briefly extinguished, Ukraine re-lit the fire. Clever link-up between Kovalenko and Konoplyanka provoked panic in Germany's defence; requiring a magnificent goal-line clearance from Boateng to deny Konoplyanka of equalising. The Ukrainian's shot looked certain to convert, but Boateng used his athleticism to full effect and kept a clean sheet in store. While Germany had the goal, possession and efficiency, Ukraine arguably enjoyed the better chances. They were unlucky not to be level at the interval; further emphasised by Yarmolenko's offside goal. A low cross whipped in to Konoplyanka bundled off Neuer's leg and fell to the 26-year who tapped home but agonisingly had it ruled out. Following a rocky end to the first half, Germany opened the second with clear intent. Boateng launched a curling pass to Draxler on the left, who swiftly cut onto his right, pinged a promising strike at goal, however to be denied by Pyatov. Failure to capitalise on Germany's frailties looked even more likely to haunt Ukraine, as Kroos began to run the show with crisp passing and excellent interchanges. Over a minute of build-up play bewildered the side i yellow, who simply couldn't deal with their class. Kroos tested Pyatov with a long-range effort, while Muller almost found himself through on goal following a sweet pass down the middle. Subsequently, Neuer then went down to his left to palm Rakitskiy's awkward free-kick around the post before Khedira's thunderous strike outside the area forced a tremendous save from Pyatov. Don't let Rakitskiy's effort fool you, though. Germany had dominated the second-half in the middle of the park; Kroos and Khedira exploiting areas of space on each flank. Howedes made a scorching run down the right and whipped a pacey delivery in to Draxler but his header was directed straight at the goalkeeper. As the second half progressed, Ukraine's ability to break out of their own half diminished. With a strong midfield, excellent in attack and even better defensively, they were robbed of possession each time they rarely obtained it. Germany started to increase the volume; more crisp interchanges from the middle to the flanks saw Gotze enter the box, but lacking decisiveness, he uninspiringly drilled a low shot at goal before Andre Schurrle curled his effort wide of the target. Ukraine's midfield and defence gradually unravelled; fresh legs of Schurrle turned out to be a smart substitution from Joachim Low. He continued knocking at the door, and this time brought Pyatov out of his box to chase a loose ball heading his direction. Germany had enjoyed a cool, calm and collected second half, but brief fear ran through their veins at the death. A standard goal-kick that should have been dealt with easily caused sheer panic after a mistake by Shkodran Mustafi allowed Seleznyov to advance through on goal, but superb awareness from Manuel Neuer and Jerome Boateng squeezed him out of possession. Then, to deceive the Ukrainians from their own corner, Germany ruthlessly broke out on the counter. Ozil obtained possession down the left flank with more white shirts than yellow, and he whipped a superb ball over to Bastian Schweinsteiger at the back post and the veteran struck sweetly first time to seal the victory.